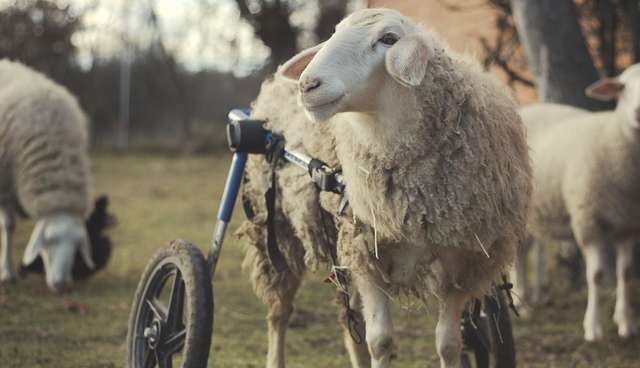 A rescued sheep who was partially paralyzed has a new set of wheels and a new lease on life. Patty, a former breeding ewe, suffered a spinal injury at birth that left her unable to walk normally -- most of her life was spent on a farm bearing lambs for slaughter. Eventually, Patty was marked for the same fate, before a group of welfare activists from Leon Vegano Animal Sanctuary, a sanctuary for farm animals in Spain, learned of the sheep's plight and came to her rescue. Even after rescue, Patty began to struggle with her steps during the winter, when icy weather made it difficult for her to maintain her balance or pick herself back up in case of a fall. Although it became increasingly clear that Patty needed a wheelchair, the sanctuary simply didn't have the budget for one. Still, organizers tried their best to afford the ewe some independence, building an alternative custom wheelchair for Patty to use while attempting to raise funds for a "real" one. After hearing Patty's story, hundreds of volunteers donated to her wheelchair fund. Now, Patty has a brand new tool that allows her to get anywhere she pleases when she pleases, without any help or injuries. Staff members at Leon Vegano say the ewe understood immediately what the wheelchair could do for her, and they've described it as Patty's new best friend.